Firehole.us is the personal website of Len Hardy (ljhardy at firehole.us) and is concentrated on planning and trip reports for yearly backcountry trips with a small group of regulars. 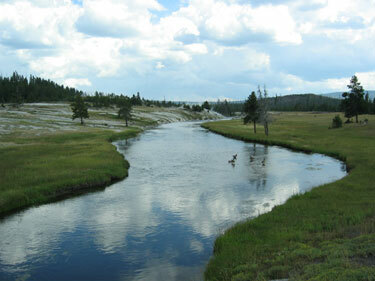 The Firehole River, in Yellowstone National Park, is the major tributary of the Madison River and flows north 21 miles from its source in Madison Lake on the Continental Divide to join the Gibbon River at Madison Junction. The Firehole flows through several significant geyser basins in the park including the Old Faithful geyser basin. The river was named by early trappers for the steam that makes it appear to be smoking as if on fire. We then made our way to West Yellowstone to check into Big Western Pine, our lodging for our night before the backcountry. It’s always nice to have a good night’s sleep and somewhere dry to pack the night before hitting the backcountry. Thus we booked this room for the night instead of car camping. Our original plan had been to start the backcountry trip today, but due to permit problems we had to back it off until Monday. We found the Big Western Pine with little trouble. We had rented a small house that was not connected to the hotel. Len went to the lobby and got directions, “it’s a gray house at 1517 Firehole street. Here is a map”. No problem! After 45 minutes of driving around, walking around, asking people, trying keys in doors of “houses” that were total dumps, we gave up in frustration and went back to the hotel for further instructions. The innkeeper agreed to drive Len to the house, with us following. She pulled right up to a green house at 1516 Firehole, and proudly announced, “see, it’s right here!” Len asked, why is it 1516 and not 1517? “Oh, the city renumbered the streets, totally forgot about that”. She did not explain why she had told him a green house was gray. Warning to down trail hikers that an up trail hiker is preparing to let one rip. Sometimes issued belatedly on steep inclines. Quality counts, and a review of the length, moistness and overall stench is generally delivered by the unfortunate down trail hiker.